THE GREAT MASTERS from Giotto to Corot and Manet and later, through their art have reflected the ideas, the thoughts and the style of societies long gone. When we look at an Old Master we see at first hand how people lived at that period, their dress, the interior of their homes, how the countryside looked then but also something of their history. Through their eyes we see the development of their ideas and how their view of the world unfolded. The earliest painting in this collection is a rare Greek icon that traces its style back one thousand years from the 12th century to the 1st century Hellenistic Roman portraits of Egypt at El-Fay�m and Antinoe. 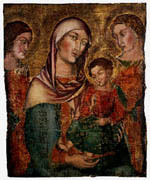 The gold-background Madonna and Child with saints from the South-East region of Italy shows the influence of the great Florentine Master Giotto. It was painted around the fourteenth century and shows how Italian art was gradually moving away from the influence of Byzantium painting. The Italian High Renaissance is represented by the superb image of a beautiful Florentine woman painted in the 1550s by Ghirlandaio. 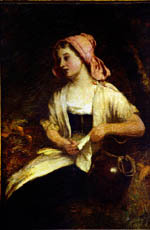 The eighteenth shows paintings of young girls by the French artist Jean-Baptiste Greuze and by the the Welsh Old-Master Richard Wilson's 1750s portrait of the tragic Miss Wynne. 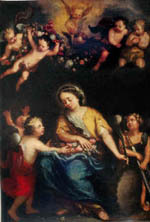 The Old Master's familiarity with classical art, literature and Old Testament writings is seen in the Judith with the head of Holofernes attributed to Carl Fabritius and The Finding of Moses by Valerio Castello. The Roman legend of Coriolanus, Gnaeus Marcius, by the Bordeaux painter Brascassat and the Three panels, Air, Earth and fire by the Flemish painter Jan van Kessel are other examples of classical themes used by Renaissance and later classical artists. 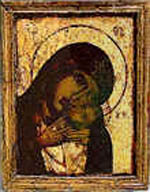 Italian 14th century Icon from the south-east (Abruzzi) region of Italy. The gold background painting on a canvas and timber support shows the strong Sienese influence, which was spreading extensively in the region, and elsewhere, at the time. 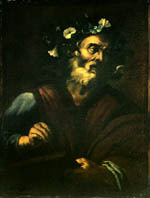 Domenico Puligo 1492 - 27. His style is Late Mannerist. 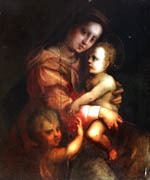 Collaborated with Andrea del Sarto with whom there is a close stylistic affinity. He is a student of Ridolfo del Ghirlandaio. Painted by the Florentine painter Michele Tosini in the period 1503-77. A pupil of Lorenzo di Credi, he took the name of the artist, Ridolfo di Ghirlandaio (1483-1561), with whom he collaborated on various paintings. 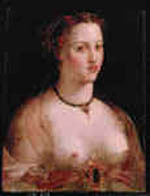 Cornelis Cornelisz van Haarlem 1562-1638. The style of the artist�s mythological paintings owes a debt to the school of Fontainebleau. His Mannerist style is allied to that of his contemporaries Hendrick Goltzius and Carel van Mander. Johann Rottenhammer I Munich, 1564/5 - Augsburg, 14 Aug 1625 German painter, who studied in Venice, his style showing influence of the 16th century Venetian school. He is considered the founder of a distinctive Italianate south German style. Carel van Mander the Dutch painter, poet and biographer mentions him in 1604. Hendrik van Balen (Antwerp 1575-1632) is a master of Peter Paul Rubens and Anton van Dyck. 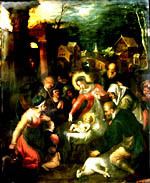 He collaborated with Rubens and with Jan Breughel de Velours. Noah's Ark is one of Jan Brueghel de Velours (Velvet Brueghel) - 1568-1625 - most renowned subjects, chosen by the artist to display his skill in depicting exotic animals, flowers and landscapes. Collaborated with Peter Paul Rubens on some of his most important paintings including the renowned Christ in the House of Martha and Mary in the National Gallery of Ireland. 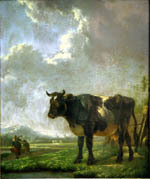 Attributed to the Dutch painter Aelbert Cuyp (Dordrecht 1620-91) for the artist's brushwork and the treatment of the grass foreground, somewhat similar to its treatment in 'Milking Cows,' catalogue no.49 in the National Gallery of Ireland. 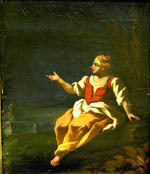 The prototype of this painting is in the Rijksmuseum (Inventory Ag1) where it was previously attributed to Carl Fabritius. The present painting is important because it shows the lower section of the painting which, in the Rijksmuseum version, has been cut away. The painting, by a Rembrandt pupil, shows the influence of Rembrandt�s sombre later style. Valerio Castello, A painter of the Baroque Genovese School 1624 - 59 His technique was warm and intense. The artist painted the subject onto a red, earth-based priming, common to this school. Attributed to Nicolas Berchem, Haarlem 1620 - Amsterdam 1683. An artist typically working in the Italianate style of the period, influenced by his sojourn, about 1640, in Italy. The influence of the Cuyp school is visible in the red-faced young woman. One of a series of paintings done by the Italian (Calabrian) painter, Mattia Preti (1630 -90). He, like numerous painters from the region, was much influenced by Caravaggio's use of light and shade. This painting is a good example of the technique. Attributed to Jan Frans van Bloemen (1662-1749), known as "Orizzonte", a Flemish painter who specialised in Italian landscapes of the Roman Campagna. The horizon and back plane is an important feature of his landscapes, hence his nickname. Considered the masterpiece of the German 'Italianite' painter Rosa da Tivoli (Pieter del Roos) 1657 - 1706, the work was painted, and signed and dated on the back, in 1703. 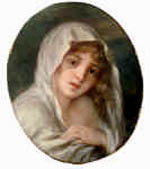 Portrait of Miss Elizabeth Wynne. 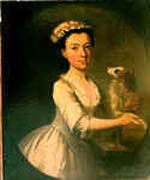 A member of an aristocratic Welsh family, she was painted by her countryman Richard Wilson (1713?-82). Painted by the French artist Jean-Baptiste Greuze (1745-1805). 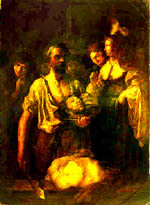 His art was described by Diderot as glorifying virtue in a period of moral. William Sadler (1782c.- 1839). Painted on to oak panel covered in hessian onto which the artist laid a gesso priming. More details on the painting see Caring for Old Master Paintings. Jacques-Raymond Brascassat 1831. Coriolanus, Gnaeus Marcius, the 5th century General being persuaded by his wife Volumnia not to march on Rome. Thomas Wilson, 19th century English School.